What to know, where to see Palm Springs' new art installation. 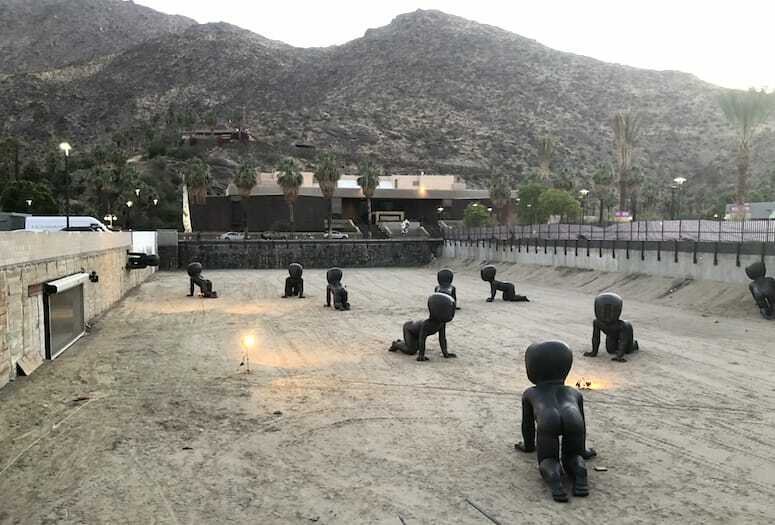 10 fiberglass babies, each weighing between 200 and 300 pounds, occupy a sand pit area behind the Kimpton Rowan Palm Springs. Tucked behind the Kimpton Rowan Palm Springs is an open space that eventually will become underground parking for a mixed-use building, part of the downtown redevelopment project. 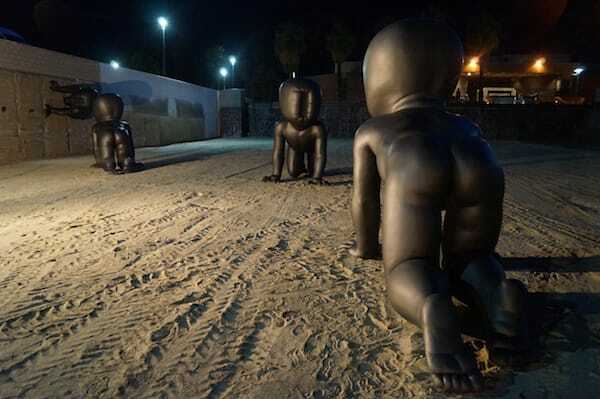 Over the next two years, however, “The Sand Pit,” as it’s been dubbed by locals, turns into a sandbox for art — beginning with 10 fiberglass babies, each one more than 11 feet long, almost 9 feet tall and weighing between 200 and 300 pounds. They are the work of Czech sculptor David Cerný. He started his “Babies” series in 1994 for the Museum of Contemporary Art in Chicago. Ten more were installed in Prague in 2000, crawling up the sides of the massive Brutalist Zizkov Television Tower. Three, cast in bronze, live on the lawn outside Prague’s Museum Kampa. But there’s more to this art than face value. Christian Hohmann of Hohmann Fine Art, the gallery representing Cerný, says the artist is addressing societal dehumanization. The “Babies” have no faces but barcodes, which Christian Hohmann of Hohmann Fine Art says is artist David Cerný’s way of addressing societal dehumanization. Tthe installation, though captured by spotlights for its opening, is not lit at night. The Palm Springs Babies are the original set from the Zizkov Tower. Hohmann says Prague officials returned the sculptures to Cerný, asking him to create new ones that would hold up to increased winds whipping around the 709-foot structure. Hohmann is not concerned about desert weather, given the heat resistance of fiberglass, but the material can be painfully hot to touch. For safety, the public is not allowed in the sand pit. Cerný’s concept adapts to the times. The first Baby appeared just as the internet was beginning to emerge. Placed on a relic of Communist control, the sculptures transformed into a defiant, populist mutiny of infants. Now they’re an Instagram lure, teasing out the personal information we reveal and conceal. Where’s the best place to see them? The “Babies” can be viewed from street level and from the upper floors of the Kimpton Rowan Palm Springs, particularly the rooftop High Bar. They are not lit at night. After checking out the “Babies”, look for another artwork, “Isabelle,” by Julian Voss-Andreae. 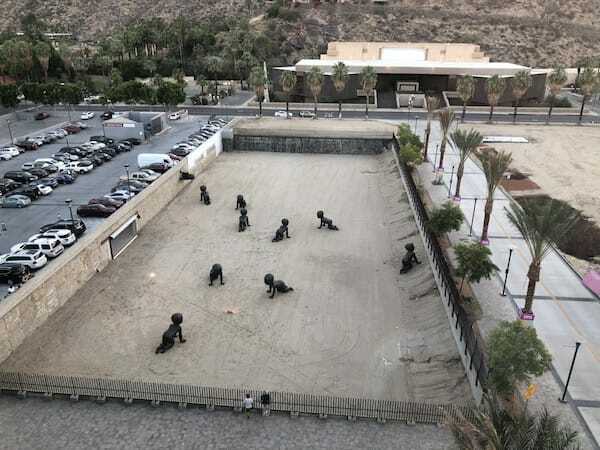 A view of the installation from atop the Kimpton Rowan Palm Springs. It’s in the passageway outside The Rowan’s Juniper Table café. This permanently installed piece changes from solid to transparent as you move around it. Were the Babies funded with taxpayer money? Although public art, the Babies were not funded with public money. Černý loaned the sculptures at no charge to Michael Braun of Grit Development, the block’s developer. Braun footed the bill to transport them from Prague and install them. I have an opinion on the Babies. Where should I direct it? Hohmann, Braun, and members of the city’s Public Arts Commission say they welcome dialogue regarding the artwork. Post your comments on social media using the hashtag #cernybabies or #palmspringsbabies. Kimpton Rowan Palm Springs, 100 W. Tahquitz Canyon Way. More information on the artist and project is at palmspringsbabies.com.